A most impressive global history of capital city relocations. A remarkable book that is both encyclopedic and expansive in ambition. By bringing together the history of dozens of capital cities in one place, Rossman offers a kaleidoscopic look at one of the core phenomena of urban life: the political capital. More than chronicling a number of separate stories disconnected by time and place, Rossman weaves together a single narrative that importantly offers several lessons. He goes beyond merely telling his story but tries to develop a framework for understanding the extent to which a new capital is a "success" or a "failure". At a time when regimes often consider moving their capital Rossman’s superb volume is an excellent reminder that such transfers are normal events. Rossman has written an indispensable book on the timeless question of the correlation between power and space, particularly as evident in capital cities. 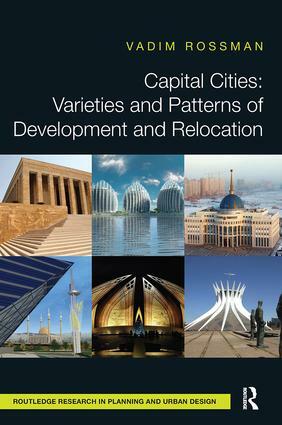 With remarkable acuity and magisterial analysis, the author brings together the philosophical reflections, historical contexts, political ramifications, economic implications, and social consequences of the (re)construction, elaboration, (re)location of, and contestations over, capital cities in all parts of the world. Capital Cities is a tour de force. Wale Adebanwi, Professor, Department of African American and African Studies, University of California-Davis, USA, and Visiting Professor, Institute of Social and Economic Research, Rhodes University, South Africa. Vadim Rossman is endowed with an uncanny ability to see systems in details, and details within abstract systems, and then also the connections between the two levels. Not to mention that he writes eminently readable prose.